A senior Chinese official has ordered tighter security in Tibetan Buddhist monasteries and on main roads following deadly protests in Sichuan province. Lhasa Communist Party Secretary Qi Zhala also warned of a crackdown on those involved in "separatist, destructive and criminal" activities. The move came after protesters clashed with security forces in parts of Sichuan province last week. At least three people are reported to have died, with dozens more injured. Sichuan province borders Tibet and several areas have large ethnic Tibetan communities. Mr Qi called on police to step up security at monasteries to prevent further unrest. "We must strike hard at all the separatist, destructive and criminal activities of the Dalai clique and make efforts to realise our goal of not letting any incident, big or small, occur," he said in a speech published on the Lhasa government website. He was referring to Tibet's exiled spiritual leader, the Dalai Lama. "Lhasa officials and functionaries at all levels, especially the police, must increase... efforts to rationally dispatch police forces and step up registration and inspection work along national roads, at key monasteries and among leading suspects." The BBC's Martin Patience says these comments highlight Beijing's growing concern that the recent unrest could spread. Observers say the recent violence is the most serious outbreak of anti-government protest among Tibetans in nearly four years. 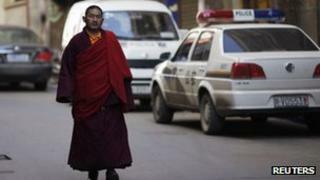 Tibetan areas of Sichuan are said to remain extremely tense. Since March 2011, at least 16 Tibetans have set themselves on fire in apparent protest against Beijing's rule. Last week three violent protests were reported in the province. China said that one protester was killed on 23 January in a confrontation with security forces in Draggo county, known as Luhuo in Chinese. China also confirmed that a Tibetan was shot dead by security forces in Seda county on 25 January, the second incident of unrest that week. And just last week, a man in Aba prefecture was also reportedly shot dead during a protest. The Chinese government claims that protesters in Draggo and Seda attacked police stations. But rights groups said that the marches were peaceful protests. The groups say the protests are a sign of rising frustration among Tibetans because of growing religious repression and harsh security measures adopted by China.